THERMOTHERAPY 3.1 is a medical “all-in-one” breakthrough solution for both reducing excess fat and circumference and collagen replenishment to tighten skin, remove wrinkles and reduce the signs of aging. This unique solution powered by clinically-proven RF technology optimized through the unique transducer triple pole delivery system is the most advanced non-invasive, pain-free, fast and effective aesthetic treatment for all areas of the body, including a special small applicator for treating very delicate areas. THERMOTHERAPY 3.1 is the third generation innovation, which enables you to get the inherent benefits of RF technology WHILE OVERCOMING potential drawbacks OF THE CONVENTIONAL UNI/BI POLAR RF. Simple to use and extremely efficient THERMOTHERAPY 3.1 treatments deliver immediate visible body and facial contouring effects from the first treatment – and long-lasting aesthetic results without surgery or downtime. 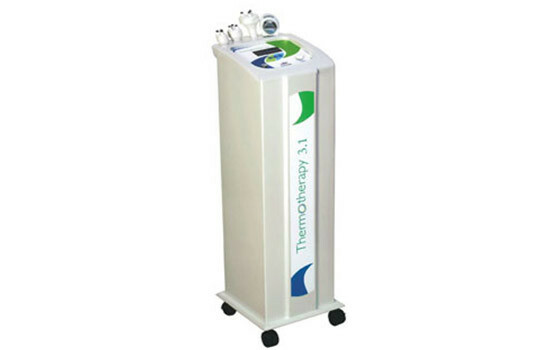 THERMOTHERAPY 3.1 uses a unique transducer to deliver RF energy at three different levels (depth) simultaneously and evenly, focusing the desired RF energy at the precise area. This controls and limits the delivery of energy to the treatment area for excellent efficacy and immediate visible results from the 1st treatment. The focused energy also enables the use of relatively low power for tissue heating, resulting in a safe, pain-free, very pleasant treatment experience. Thermotherapy 3.1 powered by our unique trio-mini probe for face and delicate areas delivers focused rf energy combined with 640 nm LLD at the precise treatment area selectively heating the collagen fibers. • The contracting collagen fibers pull and tighten immediately creating an immediate effect from the very first treatment. • The body's natural metabolism is stimulated to create collagen fibers resulting in the long term effect. • Thermotherapy 3.1 powered by our special trio-medium and multi-large probe for body delivers focused rf energy combined with 640 nm LLD at the precise treatment area selectively heats the fat cells in the deep and superficial adipose layers simultaneously. • Heating the fat cells increases their natural metabolism, resulting in increased secretion of fatty acids into the surrounding extracellular space. • The heating also increases the blood circulation in the area, accelerating metabolism that physically helps the blood and lymphatic system dispose of the fatty acids naturally. • Average reduced arm circumference of 2.1 ± 0.7 cm. THERMOTHERAPY 3.1 treatments. • The objective of the procedure is to reach a skin temperature of between 400 and 420C and maintain it for the indicated exposure time. The skin temperature is monitored throughout the procedure using a non-contact infrared thermometer. • In order to obtain positive clinical results, it is important to reach the optimal combination of skin temperature and exposure time – the endpoint. Once the required temperature is achieved the goal is to maintain that temperature for a few minutes, depending on the reaction of the skin and the size of the treatment area. Reaching the optimal temperature is sometimes accompanied by slight erythema and edema.